How to Make Your Gun Safe Childproof? 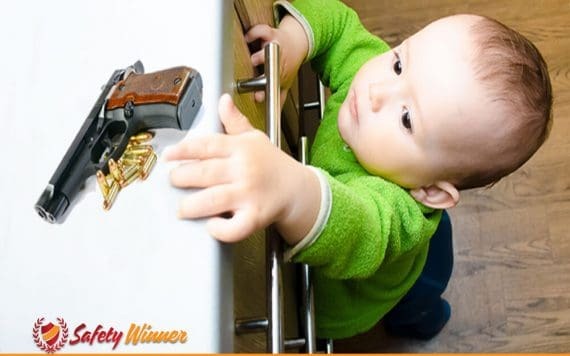 #1 How to Childproof Your Gun Safe? Children, especially boys, love to play with guns. They always aspire to be like their parents, but they are unable to fully understand the dangers associated with firearms. You as a parent have a responsibility to keep your household and your children safe. To do this many people choose to buy firearms for protection. Children can really make life hard when it comes to keeping their lives safe. With action movies now becoming more and more popular, every child wants to be a superhero and have their own gun, but they do not know the risks that are associated with guns and with great power comes responsibility. We all know how important it is to keep children away from gun safes and that sometimes, a gun safe might be tampered open. Therefore, hiding your gun safe is the only way that can help you preventing any unnecessary accidents and keep your family safe. Many brands will take the childproof features extremely serious and they will emphasize the importance of keeping children out. One of the features included to make a safe more childproof is definitely the locking system. Certain biometric locks will let you down and therefore, children easily use common techniques to open the safe. The fingerprint scanner, however, can be manipulated to be more resistant to children. We recommend keeping a wiping mechanism close by. This will enable you to wipe the scanner after every use. The same goes for keypads and we highly recommend always wiping your keypads to remove any smudges that may give clues to your password. Hiding your safe from a child can be tough and they like to search everywhere for things and accidentally stumble across the safe. A nightstand gun safe or desk safe will be great for ensuring the safety of your children and also optimal access. This means that the kids will not be able to gain access to the safe without your knowledge, but if you can keep the safe close by and still not tell them or let them see, it should keep them from discovering the safe and letting curiosity set in. Keeping your safe behind your clothing in a locked closet does seem like kind of a cliché, but when it comes to keeping it away from your children, this method is actually really effective and children will need to first access the closet before they get to the safe. This method is not only effective against children, but it might work as a method of concealment against intruders as well. By keeping the safe in a hidden location, you are increasing the safety and security of your firearms and valuables. While children love to snoop around and explore the house, it will be better practice to simply hide the safe from them. Smaller safes may be perfect for doing this. Many brands like to focus on the hiding element in their design. By taking advantage of this element, you will not need to stress the fact that children will find the safe and have the opportunity to try the locking mechanism. Safes with the feature to conceal are available in many forms and beside the desk safes and nightstand gun safes; the in-wall gun safes offer the added element of height. By simply moving the safe higher, smaller children will not be able to access the safe and once it is hidden, they may be completely oblivious to the fact that a safe is present. Security features for the home are widely available on the market and simple alarm systems are easier to get hold of in this day and age. Having a tamper proof system added to your lock will be extremely beneficial. With today’s technological advances, it is easy to connect home security devices and alarms to your mobile phones and certain cameras will allow you the benefit of two-way speakers. Having one of these close to the safe will allow you to address the child immediately and also immediately receive notifications when they are in the vicinity.While this may seem expensive, it actually is quite affordable and it really is difficult to place a price on life and the value of it. You can be sure that all the extra cash you spend will certainly even itself out over time and thus you will be provided with top of the line security. This is not so much a hiding spot, but more of a valuable tip and it is great to ensure that no one has knowledge of the safe. Children tend to be curious when it comes to seeing new things and if they are not educated on the matter or know of its existence, it will not bother them. While it might seem that children are everywhere, you can control this by accessing the safe when they are not present and keeping the entire safe a secret until they are old enough to understand the dangers of firearms. While this may not seem like the ideal childproof mechanism, having a good sit down with your child and educating them about the dangers associated with firearms will add another layer of protection to the safe. Obviously, you will need to wait until they reach an age that will let them understand what you are saying, but psychology has already proven that children are capable of understanding danger from a small age. Another factor that may relate to this tip is the physical demonstration. If you are able to demonstrate the danger associated with firearms to your children it will build up into a mental picture and since pictures are much easier to recall, you will be able to know that children will not try and open the safe without supervision. How to Build a Gun Safe Room in Your Basement?